Contemporary gardening is often understood as being suburban, as being a leisure activity or as being a television makeover opportunity. Its origins are seen as religious or spiritual (think of the Garden of Eden), military (the clipped lawn, the ha-ha and defensive ditches), aristocratic or monarchical (the stately home, the Royal Horticultural Society). George McKay explores an alternative route, through history and across landscape, linking propagation with propaganda. For everyday garden life is not only patio, barbecue, white picket fence, topiary and herbaceous border. 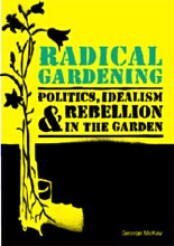 Radical Gardening uncovers and celebrates moments, movements, gestures, of a people’s approach to gardens and gardening. It weaves together garden history with the counterculture, stories of individual plants with discussion of government policy, the social history of campaign groups with the pleasure and dirt of hands in the earth, as well as media, pop and art references, to offer an informing and inspiring new take on an old subject. GEORGE MCKAY is a leading British author on aspects of alternative culture through music, protest and lifestyle. He is Professor of Cultural Studies at the University of Salford. His books include: Senseless Acts of Beauty: Cultures of Resistance since the Sixties, DiY Culture: Party & Protest in Nineties Britain, Glastonbury: A Very English Fair and Circular Breathing: The Cultural Politics of Jazz in Britain. A fairly frequent contributor to BBC Radio, he has also appeared on numerous television programmes, and written for publications such as the Guardian, Independent, New Statesman, Times Higher Education. He lives in Lancaster.